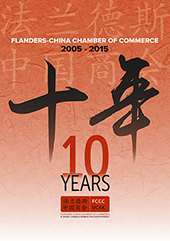 On the occasion of its 10th anniversary, the Flanders-China Chamber of Commerce has issued the publication “10 Years: Flanders-China Chamber of Commerce 2005 – 2015”. The publication bundles interviews with H.E. Qu Xing, Ambassador of the People’s Republic of China to Belgium; H.E. Michel Malherbe, Ambassador of Belgium to the People’s Republic of China; Mrs. Claire Tillekaerts, CEO of Flanders Investment & Trade; Mr. Stefaan Vanhooren, President Agfa Graphics; Mr. Matthew Taylor, CEO, Bekaert; Mr. Stephan Csoma, Executive Vice President and two other Executives, Umicore; Christian Dumoulin, CEO, Vitalo; Filip Goris, General Manager Asia, Recticel; Mr. Hudson Liu, CEO, Huawei; Mr. Li Shufu, Chairman, Zhejiang Geely Group; Mrs. Chai Hui, General Manager Brussels Branch, ICBC; Mr. Robert Zhao, Chief Representative of the Weihai EU Office in Ghent; Mr. David Liu, Deputy Managing Director, APM Terminals; and Mr. Ma Jian, Chairman, Tianjin Liho Group. Mr. Geert Bourgeois, Minister-President of the Government of Flanders, wrote the foreword to the publication. Chairman of the FCCC, Mr. Bert De Graeve, provided the introduction and Mrs. Gwenn Sonck, Executive Director of the FCCC, provided some more details about the FCCC. The publication is available to Members of the FCCC free of charge. Here is the link to the brochure online. 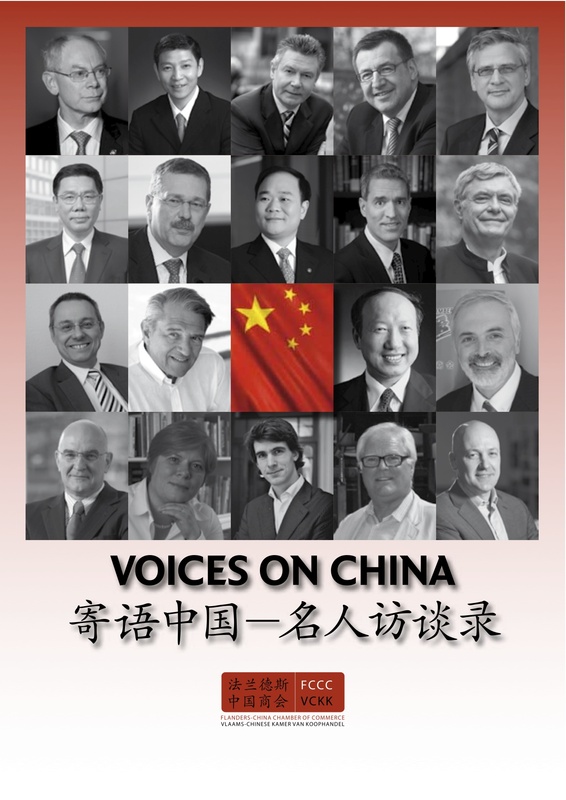 The Flanders-China Chamber of Commerce (FCCC) has published the second volume of “FCCC Members’ Portraits in China”. The booklet includes 17 portraits of member companies active in China. The China-based managers of those companies talk about how their firms became active in the country and the difficulties and pitfalls they faced to become successful in the largest and most challenging market on earth. They offer valuable insights and lessons about how to do business in China. Each manager interviewed makes a list of “do’s and don’ts” based on their own hard-won experience. “All of them, without a single exception, enjoy their work and stay in China, despite less pleasant phenomena such as the worsening air pollution,” says FCCC Chairman Bert De Graeve in his introduction. Some of the companies presented in “FCCC Members’ Portraits in China” are well known, such as Volvo Car, which is now part of Geely Holdings. But the story of how the company is building two car plants in China has never been told as extensively before. Other companies, such as Huiyin Group, which is active in the solar power industry, and Klako Group, which is guiding its clients to become successful in China, are not so famous, but have an equally fascinating story to tell. Trying to write a write a book “Doing Business in China for Dummies” is futile, one of the managers told the Flanders-China Chamber of Commerce. More fundamental than that is an underlying attitude. Respect the Chinese you come into contact with and be interested in their culture. Remember, he added, that you are and will always remain a guest in their country. Above and beyond the usual tips and tricks, the managers telling their story in this booklet show the right attitude to become successful in China. “The growth of the Chinese economy is slowing down a bit,” says Chairman Bert De Graeve in the introduction, “but at 7.8% last year, it is still growing strong to offer a myriad of opportunities.” For those companies which have not yet taken the step to open a representative office, set up a subsidiary or form a joint venture, it is probably not too late yet to enter the Chinese market. “Do your homework” is one of the most frequently tendered pieces of advice for companies contemplating their first steps on the China market. One might as well start with “FCCC Members’ Portraits in China, Volume 2”. ACEA (Dominik Declercq), De Wolf & Partners (Philippe Snel), Eurbridge (Jan Van der Borght), Huiyin Group (Juha Ven), Jones Day (Sébastien Evrard), Klako Group (Kristina Koehler), LMS (Luc Pluym), Moore Stephens (Andries Verschelden), Neuhaus (Frédéric Linkens), Orientas (Dirk Laeremans), procurAsia (Etienne Charlier), Proviron (Vanessa Doms), Soudal (Eddy Vloeberghen), Urban Stream (Sébastien Goethals), Volvo Car (Koen Sonck and Benoit Demeunynck), White Pavilion (Raf Vermeire), and Wyatt & Wang (Jacques Borremans). On the occasion of the largest trade mission ever sent to any country – headed by HRH Prince Philippe – and on the 40th anniversary of the establishment of diplomatic relations between Belgium and China, the Flanders-China Chamber of Commerce (FCCC) publishes a book with interviews of famous Flemish, Chinese and other personalities covering a wide range of topics related to China. The Chamber asks them how many times they have visited China and what major changes they have witnessed in that emerging Asian power. Some have visited China only a couple a times and are amazed at what they have discovered, eager to visit the country again at the earliest opportunity. Others lost count as the number of visits runs into the hundreds, and they still can’t get enough. One thing everybody agrees on is that China is changing at an extraordinary speed and to keep up with it one cannot postpone the next visit for too long. Following a foreword by Steven Vanackere, Vice Premier of the Belgian federal government and Minister of Foreign Affairs; and an introduction by Bert De Graeve, Chairman of the Flanders-China Chamber of Commerce and CEO of Bekaert, famous personalities talk about their experiences in China, the successes and pitfalls of doing business there and what we could learn from the Chinese. The “Voices on China” presented here are diverse: from Chairman of the European Council Herman Van Rompuy and EU Trade Commissioner Karel De Gucht to CEOs of Flemish companies who have proven to be successful in China. Bert De Graeve, CEO of Bekaert; Christian Reinaudo, CEO of Agfa-Gevaert Group; Marc Van Sande, Executive Vice-President Energy Materials of Umicore; and Wim Buyens, Senior Vice-President Entertainment Division at Barco; talk about the differences in business culture between Belgium and China, about measures to further improve trade and investment between the two countries; and about what it takes to be successful in China. Jonathan Holslag, Research Director at the Brussels Institute of Contemporary China Studies, in a wide-ranging interview, covers China’s rise as a world power and the challenges it faces to become No 1. He also gives his informed insights into the next generation of Chinese leaders, which will assume office following next year’s 18th Congress of the Chinese Communist Party. Chinese investments in Flanders are increasingly important. Li Shufu, Chairman of Geely Holding, which recently took over Volvo, talks about the future of green cars and how to solve China’s traffic problems. Liao Liqiang, the Ambassador of the People’s Republic of China to Belgium, who only took up his post a few months ago, covers all aspects of the relations between the two countries. He recalls the visit to Beijing by Queen Elisabeth in 1961, a decade before the establishment of diplomatic relations. Two Chinese captains of industry, Chairman Jiang Jianqing of the Industrial and Commercial Bank of China (ICBC) and Chairman Chen Feng of Hainan Airlines, talk about the financial and aviation industries respectively. The “voices” assembled in this book shed a new light on China. “We hope you enjoy listening to them,” concludes FCCC Chairman De Graeve. The book is bilingual English-Chinese. Members can obtain a copy of the presentation by sending an e-mail to info@flanders-china.be.